SQL plays an important role in the IT Industry. Learning SQL increases the Job opportunities. People learn SQL for various reasons. For example, some people will learn it for writing SQL queries to be used in their web applications. Some learn it to become a Database Admin. And, there may be some differences based on the type of Database Server, i-e whether it is MySQL or Microsoft SQL, SQLite, etc. 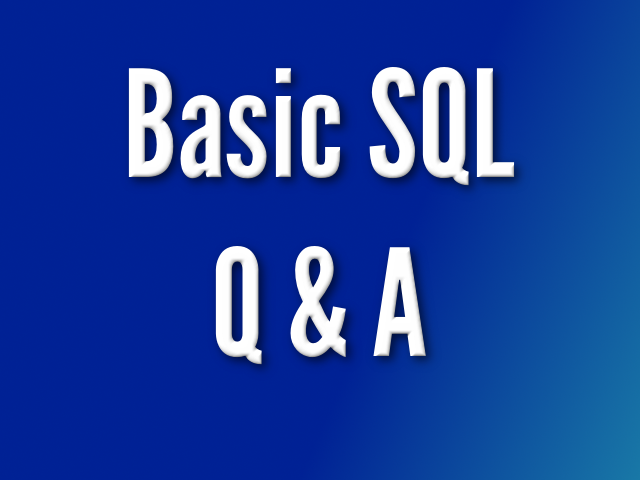 This post is for telling about very basic things about SQL. So, it can be useful for anyone who is willing to learn SQL for any purpose. A Database Management System (DBMS) is a program that controls creation, maintenance and use of a database. DBMS can be termed as File Manager that manages data in a database rather than saving it in file systems. Some DBMS examples include MySQL, PostgreSQL, Microsoft Access, SQL Server, FileMaker, Oracle, RDBMS, dBASE, Clipper, and FoxPro. Sample Databases: School Management System, Bank Management System, Time Sheet Management System. What are the Popular Database Management Systems in the IT Industry? MySQL is the widely used open source Database system which is available for Free. SQL stands for structured query language. It is a database language used for database creation, deletion, fetching rows and modifying rows etc. sometimes it is pronounced as se-qwell. SQL is an ANSI (American National Standards Institute) standard. How much time it will take to learn SQL? As far as time is concerned - in 2-3 weeks you can learn the basics and in a month's time (provided you are spending atleast 3-4 hours daily). you can learn to write basic SQL statements. In-depth SQL will need more time and practice. What are the applications make it very easy to install both MySQL and PhpMyAdmin? How to install LAMP in LINUX? Setup the php/mysql development environment easily by installing LAMP by running below commands. WAMP is created by Romain Bourdon. It supports dynamic scripting languages like PHP, Python, Perl. It is an Windows application server platform. Once WampServer is installed, you can manually add aditionals Apache, Php or MySql versions. WampServer is available for free (under GPML license) in two distinct versions : 32 and 64 bits. How to install WAMP in windows operating system? Select Versions and Download WAMP server from this link. MAMP stands for Macintosh, Apache, MySQL, and PHP. MAMP is an application you can install on your Mac which allows you to have access to a local PHP server and MySQL server. Essentially, MAMP gives you all of the tools you need to run WordPress on your machine, for development and testing purposes. MySQL is a also a Database tool itself that uses SQL language. It is open source. MySQL is a relational database management system. You can submit SQL queries to the MySQL database to store, retrieve, modify or delete data. PL/SQL, Oracle's procedural extension of SQL, is an advanced fourth-generation programming language (4GL). It offers software-engineering features such as data encapsulation, overloading, collection types, exceptions, and information hiding. PL/SQL also supports rapid prototyping and development through tight integration with SQL and the Oracle database. What are the standard SQL commands every SQL developer should know? CREATE: It creates a new table, a view of a table, or other object in database. ALTER: It modifies an existing database object, such as a table. DROP: It deletes an entire table, a view of a table or other object in the database. GRANT: Grants privileges to users. REVOKE: Revokes privileges previously granted to a user. Constraint in database set certain rules or property in a table. NOT NULL: Prevents a column from having a NULL value. DEFAULT: Specifies a default value for a column where none is specified. PRIMARY KEY: Uniquely identifies rows/records within a database table. FOREIGN KEY: Uniquely identifies rows/records from external database tables. UNIQUE: Ensures all values are unique. CHECK: Checks values within a column against certain conditions. INDEX: Quickly creates and retrieves data from a database. A Database query is a code written in order to get the information back from the database. Query can be designed in such a way that it matched with our expectation of the result set. Simply, a question to the Database. A subquery is a query within another query. The outer query is called as main query, and inner query is called subquery. SubQuery is always executed first, and the result of subquery is passed on to the main query. An index is performance tuning method of allowing faster retrieval of records from the table. An index creates an entry for each value and it will be faster to retrieve data. A field in database is defined as the area within a record reserved for a specific piece of data. A record in the database is defined as the collection of values or fields of a specific entity. Union, intersect or minus operators are called set operators. The MERGE statement allows conditional update or insertion of data into a database table. It performs an UPDATE if the rows exists, or an INSERT if the row does not exist.The MERGE statement allows conditional update or insertion of data into a database table. It performs an UPDATE if the rows exists, or an INSERT if the row does not exist. What is a NULL value and how does it differ from a zero value? What are the ways to maintain data integrity within a RDBMS? Entity (Row) Integrity: Avoids duplicate rows in tables. Domain (Column) Integrity: Restricts the type, format, or range of values to enforce valid entries. Referential Integrity: Ensures rows used by other records cannot be deleted. User-Defined Integrity: Enforces rules set by the user that do not fall into the other categories. As a special case, a table (base table, view, or joined table) can JOIN to itself in a self-join. SQL Injection is a technique in which malicious users(Hackers or Attacker) inserts SQL command(malicious or unwanted SQL commands). Can you remove rows from a table based on values from another table? What is a Relationship and list their types? What is the Purpose of the Distinct Clause in SQL? SQL* Plus is a command line tool proprietary to Oracle. You can send SQL queries to the server using the tool. It can also help you format the result of a query. T-SQL (Transact-SQL) is a set of programming extensions from Sybase and Microsoft that add several features to the Structured Query Language (SQL). What is identity in SQL? An identity column in the SQL automatically generates numeric values. We can defined a start and increment value of identity column. What is Key in SQL? key is a set of column(s) that is used to uniquely identify the record in a table. It is used to fetch or retrieve records / data-rows from data table according to the condition/requirement. Keys are also used to generate relationship among different database tables or views. What are the keys are available in SQL? NoSQL databases are increasingly used in big data and real-time web applications. What is a difference between SQL and iSQL*Plus? SQL Is a Language. iSQL*Plus Is an Environment. In SQL, Character and date columns heading are left-justified and number column headings are right-justified. In iSQL*Plus, Default heading justification is in Centre. In SQL, Use Functions to perform some formatting. In iSQL*Plus, Use commands to format data. Primary should not allow null; where as unique key will allow nulls. By default Primary key is created as clustered index; whereas unique key is created as non clustered index. Can Primary key is a Foreign Key on the same table? Yes, Primary key is a Foreign Key on the same table. What are two methods of retrieving SQL? What is a event handler in sql? SQL Profiler is a graphical tool that allows system administrators to monitor events in an instance of Microsoft SQL Server. You can capture and save data about each event to a file or SQL Server table to analyze later. For example, you can monitor a production environment to see which stored procedures are hampering performances by executing too slowly. What are the common performance issues in SQL Server? Find below some of the Books that are useful for learning SQL. You can buy them from Amazon by clicking the below links.